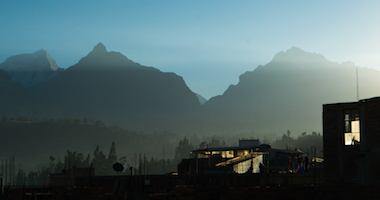 "If in the making of the West, Nature had what we call parks in mind, —places for rest, inspiration, and prayers, —this Rainier region must surely be one of them." Rising 14,410 feet above sea level and located just 50 miles southeast of Seattle, Mt. Rainier is the centerpiece of Mt. Rainier National Park and the highest volcanic peak in the Cascade Range that stretches from Washington through Oregon and into northern California. Formed on March 2, 1899 by President William McKinley as the nation's fifth national park, Mt. Rainier National Park has become an integral cultural landscape for over 2 million visitors that come to the Park every year to study and explore everything from its alpine glaciers and volcanic strata (sedimentary rock and soil layers), to the subalpine wildflower meadows and ancient forests that flank the mountain's lower slopes. The National Park Service (NPS) celebrated it's centennial on August 25, 2016 recognizing 100 years of stewardship of our country's national parks. The NPS strives to engage communities through recreation, conservation, and historic preservation programs that educate visitors on the unique cultural landscapes that define our parks and the significance in working for their preservation. The cultural landscapes of Mt. Rainier National Park are a product of the distinctive ecosystems, geology and glaciology, early settlers and native communities, and historical significance in the world of climbing and exploration. By entering the Park as visitors and climbers, it is our responsibility to respect the rich cultural and ecological history of the Park, and act as stewards in the preservation of this unique and fragile environment. As climbers we spend a great deal of time, effort, and resources to create a successful and memorable mountain experience. Equally important to the gear list and mountaineering skills required to undertake a summit climb is an understanding of the history behind the environment with which we will so intimately interact. It is a privilege to be able to challenge ourselves and find enjoyment amongst these amazing landscapes. We encourage you to explore the below topics in preparation for your climb. A cultural landscape is a geographic area, including both cultural and natural resources and the wildlife or domestic animals therein, associated with an historic event, activity, or person, or exhibiting other cultural or aesthetic values. Mt. Rainier National Park boasts a variety of ecosystems and is sought out by scientists and students who come to perform studies and do research on climate change, animal and plant life, geology, glaciology and volcanic activity. Mt. Rainier is an active volcano and is in a constant state of change, although not always easily visible to the human eye. The interaction of the Park's diverse and changing ecosystems and natural features plays a critical role in understanding the effects of climate change and how it is altering the landscape of Mt. Rainier. Mt. Rainier National Park encompasses 236,381acres on the west-side of the Cascade Range, and is approximately 97 percent wilderness and 3 percent National Historic Landmark District. The Park contains 25 named glaciers across 9 major watersheds, with 382 lakes and 470 rivers and streams and over 3,000 acres of other wetland types. This complex ecosystem produces varied climatic and environmental conditions across the Park's 12,800-foot elevation gradient. Forest ages range from less than 100 years old to old-growth stands of more than 1,000 years. Some alpine heather populations have existed in the Park for up to 10,000 years. The Park contains 25 named glaciers across 9 major watersheds with 382 lakes and 470 rivers and streams, and over 3,000 acres of other wetland types. A Park Ranger stands next to an old-growth Douglas Fir tree in Mt. Rainier National Park. Over half (approximately 58 percent) of the Park is covered by forest and can be divided into low-, mid- and high-elevation forests starting at approximately 1,700 feet (500 meters) and rising to approximately 6,000 feet (1,800 meters). These individual elevation bands nurture different species and ages of trees that are affected by aspect (exposure to the sun), elevation, snowpack duration, and areas of disturbance such as those affected by fires, debris flows, or those exposed by receding glaciers. Below is a description of the different species of trees within the Forest Zone that you will see in the Park. Low elevation forests are distributed from the Park's boundary from 1,700 feet to 2,700 feet (approx. 500-800 meters) in elevation and are dominated by western hemlock, Douglas fir, and western red-cedar. Mid-elevation forests extend from 2,700 feet upward to 4,000 to 6,000 feet (approx. 1,200-1,800 meters) in elevation depending on aspect, and contain Pacific silver fir, Alaska yellow cedar, western white pine, and noble fir. High elevation forests rise from about 4,500 feet (approx. 1,400 meters) to the 7,000 feet (approx. 2,100 meters), and are characterized by subalpine fir, mountain hemlock, and Alaskan yellow cedar. Whitebark pine and Englemann spruce are present in drier sites on the east side of the Park. As you ascend higher in elevation, trees become less dense and the forest transitions into subalpine terrain that makes up approximately twenty-three percent of the Park and consists of sporadic tree groupings set amongst meadows from approximately 5,000 feet to 7,000 feet. This subalpine zone is home to the lush meadows of wildflowers that bloom once the snowpack has melted, sometimes not until late June, if not later, and are one of Mt. Rainier's most sought after attractions. These wildflowers bloom aggressively in order to take advantage of the short growing season. There are five general vegetation types found in the meadows. Learn more about them in the descriptions below. Heather | Bell-heather | Huckleberry Communities (Phyllodoce, Cassiope, Vaccinium): areas of dense, low shrub dominated by heather and huckleberry on the south and west sides of the Park, such as Paradise and Indian Henry's Hunting Ground. Huckleberry is the same species as blueberry, and produces those familiar, edible berries in the fall. Sitka Valerian | Showy Sedge Communities (Valeriana sitchensis, Carex spectabilis): tall, dense stands of perennial wildflowers found all around the mountain, particularly in areas were avalanche disturbance prevents the growth of shrubs and trees. In addition to Sitka valerian, numerous wildflower species fall under this vegetation type including lupine, American bistort, pasqueflower, paintbrush, mountain daisy, gray's lovage, glacier lily, and avalanche lily. Black Alpine Sedge Communities (Carex nigricans): dense mats of black sedge, usually found in areas with persistent late-season snow and a very short growing season. May also contain showy sedge and mountain hairgrass, interspersed with wildflower species such as alpine aster, alpine willow-herb, and partridgefoot. Low Herbaceous Communities: dominated by mosses, usually found in areas of disturbance or unstable soil. Vegetation grows in clumps, possibly with patches of bare ground visible. Species found in this vegetation community include saxifrage, black sedge, hawkweed, partridgefoot, alpine buckwheat, and pussytoes. Green Fescue Communities (Festuca viridula): grassy meadows of green fescue, also known as mountain bunchgrass, flourish on the drier east side of the Park, which receives less snow and rainfall due to the rain shadow of Mt. Rainier. Other species that characterize green fescue communities are lupine, fan-leaf cinquefoil, and cascade aster. This zone encompasses the remainder of the Park extending from the treeline to the mountain's summit, half of which is permanently covered by snow and ice. A few select species of alpine vegetation are able to survive in this zone and can be found in fell fields, talus slopes, snow beds and heather communities. The heather types in the Park are the oldest known plant community in the Park and are estimated to have been around for up to 10,000 years. The talus slopes and snow beds have small, well-spaced groups of plants that are often overlooked by visitors. Much like the forest and subalpine zones, the type and location of these organisms is controlled by length of growing season, slope, and aspect (exposure to the sun). You will (often unknowingly) encounter many of these alpine vegetation types on the hike to Camp Muir at a variety of elevations. Take special care to not disturb these plants. The harsh environment and short growing season in which they persist makes these plants especially sensitive to our presence and not likely to regenerate if damaged. Fell Fields: Areas with gentle slopes covered by small rocks, and small persistent patches of snow with small dispersed groups of plants. Talus Slopes: Talus slopes are among the first areas free of snow and therefor have the longest growing season. Small snow beds and small, well-placed groups of plants often overlooked. Heather: This is the oldest known community of vegetation in the Park estimated to have persisted in the Park for up to 10,000 years. Heather is the oldest know type of vegetation and is estimated to have been around in the Park for up to 10,000 years. There are over 964 species of plants (hundreds of which are wildflowers) and approximately 275 species of birds, mammals, amphibians, reptiles, native fish and insects, some of which are federally listed as species of concern or imperiled species of concern by the state of Washington. Species that have historically occurred in the Park but are no longer believed to be present include the gray wolf, grizzly bear, and Canada lynx. On any given day exploring the trails in the Park, setting out for a climb, or spending time at Camp Muir, you are likely to see multiple species of birds, rodents, hooved animals and occasionally other large mammals such as black bears and elk. Marmots, chipmunks and black-tailed deer are frequently seen on the trails around Paradise as you hike out to school or begin your climb to Camp Muir. Black bears (sometimes with their cubs) can also be seen along these trails and are known to inhabit many different areas during the summer. If you're lucky, you can spot the occasional mountain goat higher in the subalpine or alpine areas. Camp Muir is visited by foxes that have been known to eat food from climbers' packs and tents. 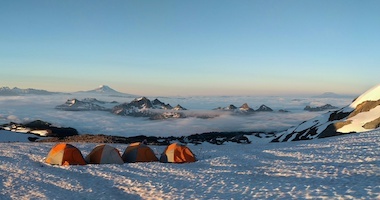 They have become habituated to our presence at Camp Muir and climbers should diligently manage their food and trash by not storing food outside in packs or tents, and packing out all trash when you descend from your climb. In doing this, we can help minimize our impact on the climbing route and practice sustainable climbing. Some of these species have become habituated to our presence in the Park and will often allow you to be in close proximity to them as you walk by. As exciting as this can be to get an up close view of these creatures, we ask that all of our climbers avoid attempting to interact with them or feed them as this creates a positive association with human presence that can be harmful to their natural, biological and survival behaviors. Learn more about some of these animals below. There are over 964 species of plants and approximately 275 species of birds, mammals, amphibians, reptiles, native fish and insects that call Mt. Rainier National Park home. Hoary Marmot: Hoary Marmots are common in the subalpine regions in the Park, where they eat vast amounts of meadow vegetation. They are named for the grizzled grey fur on their shoulders and upper back, which fades to brown on the lower back. The Marmot hibernates during the winter and can sleep more than half the year in its burrow until the snow melts. Marmots are sometimes called "Whistlers" for the shrill whistle call they can make to warn against the presence of potential predators. Marmots are seen frequently on the hike to our school training sites as well as on the lower portion of the hike to Camp Muir. Yellow Pine Chipmunks: The Yellow Pine Chipmunk is the more common chipmunk species in the Park, found in a wide range of habitat from meadows to coniferous forests. They can be tawny to pinkish cinnamon in color, with three dark and two light stripes on the face, and five dark and four light stripes on the back. Yellow Pine Chipmunks love berries, but will also feed on nuts, seeds, grasses, mushrooms, and the occasional insect. Black-tailed Deer: Black-tailed Deer are a sub-species of Mule Deer found west of the Cascade Mountains. Black-tailed Deer have all black tails and have large, fuzzy, mule-like ears, red-brown coats, and white rumps. These deer are found widely in the park's forested regions. In summer, bucks will move to higher elevations while does and fawns stay at lower regions. Deer are most active at dawn and dusk and they eat a variety of grasses and vegetation. Mountain Goat: In contrast to their shaggy all-white coats, Mountain Goats have black lips, eyes, noses, and hooves. A dense warm undercoat allows them to live comfortably at high elevations even during winter. Their hooves have a hard outer ring with a spongy center that helps them "stick" to rocks. Mountain goats are nimble climbers, easily traversing steep rock slopes and cliffs and can be found in subalpine and alpine regions in the Park. Eight species of fish such as the Bull Trout, Steelhead, Chinook Salmon, and Puget Sound Coho Salmon. The Cascade Fox which is at high risk due to habitat change and road traffic accidents. Native insects which are under threat from introduced species brought in by firewood transported by other areas. Several bird species such as Northern Goshawk, Harlequin Duck, and Little Willow Flycatcher. The vegetation of Mt. Rainier National Park is incredibly diverse. The variations in climate and elevation throughout the Park create a range of habitats that support an extensive number of plant species throughout the forest, subalpine and alpine zones. Perhaps the most notable and admired are the wildflower species that bloom in abundance during the summer months. Once the snow melts, the forest and subalpine regions almost immediately begin to fill with wildflowers and brilliant colors that draw many visitors to the Paradise area. Due to the short growing season for these wildflowers, they bloom profusely in order to reproduce as quickly as possible before the snow returns. Some of the commonly seen species around Paradise and throughout the Park are shown in the photos below. American Bistort: Perennial with one to several unbranched flowering stems 8-28 inches (20-70 cm) tall and narrow, oblong basal leaves about 4-8 inches (10-20 cm) long. These flowers have a bottle brush type appearance and are very common in subalpine meadows, and can be one of the earliest flowers blooming at Paradise. Avalanche Lily: Avalanche Lilies can be seen on the hike through White River Campground and Glacier Basin on the Emmons route among other areas. Stems are 6-16 inches (15-40 cm) long, with usually 2-3 flowers each. It takes many years for these plants to begin flowering, but they grow in abundant colonies throughout subalpine regions in the park. They are often the first to flower along the edges of melting snow. Closely related to Glacier Lily. Broadleaf Arnica: A common subalpine species; it can be found growing alone or in clustered groups formed from spreading rootstock. Stems reach about 20 inches (50 cm) in height, with oval, toothed leaves. Broadleaf Lupine: Along with the closely related Dwarf Lupine, the Broadleaf Lupine is perhaps one of the most recognizable wildflowers in the Park because of its color and abundance. Branched, hairy stems between 12-24 inches (30-60 cm) tall, with 7-8 leaflets per leaf. Abundant in open areas and meadows throughout the Park's lower elevations up to about 5,000 feet (1,500 meters), where it tends to get replaced by the smaller but similar-looking Subalpine Lupine (Lupinus articus). Cascade Aster: Though the purple flowers are similar to Alpine Aster (Oresostemma apligenum), this plant is marked by multiple flowers on each stem, not just one, and also grows to be much taller, reaching 24 inches (60 cm) high. Leaves are hairless on top, woolly underneath, and smaller lower on the stem. Common in subalpine meadows above 5,000 feet (1,524 meters). Dwarf Lupine: Along with the closely related Broadleaf Lupine, the Dwarf Lupine is perhaps one of the most recognizable wildflowers in the Park because of its color and abundance. Less than 6 inches (15 cm) tall, this smaller relative of Broadleaf Lupine (Lupinus latifolius) grows at higher elevations in the Park, generally above 7,000 feet (2,100 meters). Grows to form mats with a stout, woody base, and silvery leaves with 5-7 leaflets. Edible Thistle: Easily identified by its purple, fuzzy flowers and spiny leaves, thistle has stout, leafy stems, ranging from 20-80 inches (50-200 cm) tall. Found throughout the Park in open forest, hillsides, and along roads. Scarlet Paintbrush: Very common (also known as "Common Red Paintbrush"), mostly found above 5,000 feet (1,524 meters). This paintbrush stands 8-16 inches (20-40 cm) tall with lance-shaped leaves. The leaves are a good way to distinguish this paintbrush from other paintbrush species, which have lobed leaves. White Mountain Heather: Easily visible on the trails in some areas as you hike above Paradise to school sites and Camp Muir in the higher subalpine elevations. Small, scale-like evergreen leaves arranged in four rows cover stems up to 12 inches (30 cm) long. Common in subalpine Parkland, where it can form extensive mats. Pink Mountain Heather: Forms low, branched mats with stems 4-16 inches (10-40 cm) tall and covered with alternating, needle-like evergreen leaves. Common in subalpine meadows between 5,000-8,000 feet (1,500-2,400 meters). Pasqueflower / Western Anemone: The entire plant is coated in long hairs, with segmented leaves and 4-12 inches (10-30 cm) tall flowering stem. The feather-like "mouse-on-a-stick" seedhead (pictured right) is a common sight in Mt. Rainier's meadows, particularly in Edith Creek Basin and along the trails around Paradise. Sitka Mountain Ash: This six foot-high (2 meters) shrub grows in thickets and is widespread above about 4,500 feet (1,400 meters). Flowers in tight clusters at the ends of branches, and produces bright red berries favored as a food source by birds and other wildlife. These can be easily spotted along the paths around Paradise after we depart the parking lot. Magenta Paintbrush: Easily identifiable by it's bright pink "magenta" color, this paintbrush is one of many species of paintbrush found in the Park. Plant grows to about 6-12 inches (15-30 cm) tall, and leaves have 1-2 slender lobes. Abundant in subalpine meadows, particularly in the Sunrise area. Paradise is famous for its glorious views and wildflower meadows. When James Longmire's daughter-in-law, Martha, first saw this site, she exclaimed, "Oh, what a paradise!" At 14,410 feet, Mt. Rainier is the most prominent peak in the Cascade Range and is considered an active volcano with its last minor eruption approximately 1,000 years ago. The mountain stands nearly three miles higher than the lowlands to the west and one and one-half miles higher than the adjacent mountains. Mt. Rainier has a topographic prominence of 13,211 feet which is greater than that of K2, the world's second tallest mountain. Composed of mostly of andesite, Mt. Rainier has been highly eroded due to massive glacier activity and debris flows. It is very likely that Mt. Rainier once stood even higher than today at about 16,000 feet (4,900 meters) before a major debris avalanche and the resulting Osceola Mudflow occurred approximately 5,600 years ago. In the past, Mt. Rainier has had large debris avalanches, and has also produced enormous lahars (volcanic mudflows) due to the large amount of glacial ice present. These lahars have reached all the way to Puget Sound, a distance of more than 30 miles (48 kilometers). Topographic Prominence is the elevation of a summit relative to the surrounding terrain; or the elevation of a summit relative to the highest point to which one must descend before re-ascending to a higher summit. About 40 million years ago, much of what is now western Washington lay beneath the sea. The volcanoes that were tall enough to stand above the sea level spread lava flows, lahars, and volcanic sediments across the entire region. About 10 million years ago compressional forces along the western margin of the North American Continent began to uplift rocks. This eventually led to the creation of today's Cascade Range, upon which the active volcanoes sit. Mt. Rainier grew from about 2 to 1 million years ago, and the modern volcano began to grow about 500,000 years ago. Mt. Rainier grew in four major stages of alternating high- and low-volume eruptive activity, each averaging a little more than 100,000 years' duration. It was built by the accumulation of lava flows and rock rubble. During high-volume stages, lava flows traveled as far as 15 miles from the vent with single flows having a volume of as much as 2 cubic miles. During low-volume stages, lava flows rarely extended beyond 5 miles from the summit with individual flows typically no more than 0.24 cubic miles. Glaciers have mantled Mt. Rainier for most or all of its 500,000-year lifespan and played an integral role in shaping the volcano. Many lava flows that erupted during ice ages were unable to melt entirely through the thick, valley-filling ice and instead chilled and hardened beside it. With continued eruptions, the lava would skirt the margins of the glaciers advancing only where ice was thin or absent. After retreat of the glaciers at the end of the Pleistocene, these lava flows were left perched high on the sides and crests of ridges, much like docks stranded along the shoreline of a shrinking lake or reservoir. This process accounts for why lava flows cap many of the ridges radiating from Mt. Rainier instead of filling the deep valleys. Mt. Rainier is susceptible to lahars and debris flows because of the abundance of ice, loose volcanic rock, and surface water, and because some slopes have been weakened by the interaction of groundwater and volcanic gases. Lahars (previously called mudflows) consist of a hot or cold mixture of water and rock fragments that flow down the slopes of a volcano and typically enter a river valley. Debris flows are similar in character to lahars, but are unrelated to eruptive activity and are caused by increases in water from precipitation, glacier melt and glacier floods. Several lahars and debris flows contributed to the geological makeup of Mt. Rainier and the surrounding areas. There are three notable lahars that played a large role in the relatively recent geologic events. Lahar pathways from events on Mt. Rainier showing the three major events from the last 10,000 years. (Graphic: Modified from Crandell(1971) and Vallance and Scott (1997)). The Osceola Mudflow of 5,600 years ago was Mt. Rainiers signature event during the Holocene (11,000 years ago to today). During a period of eruptions, the volcano's summit and northeast slope slid away, creating a 1-mile-wide horseshoe-shaped crater open to the northeast. This massive landslide removed 0.5 to 0.7 cubic miles (2 to 3 cubic kilometers) of rock, ice, and debris quickly turning into a fast-moving lahar that traveled through the present-day Enumclaw where it flowed and broadened toward and into the Puget Sound. Since that time, lava flows and other eruptive products refilled much of the crater and formed the present summit cone. The National Lahar, which occurred sometime between 2,200 and 500 years ago, is one of many lahars that was formed by the melting of snow and ice during volcanic eruptions. The lahar originated on the south flank of Mt. Rainier and flowed violently down the Nisqually River Valley, reaching as far as Puget Sound. It is notable as one of the larger examples of a lahar formed by snow and ice melt during an eruption, the most common cause of lahars on Mt. Rainier. The Electron Mudflow of approximately 500 years ago is remarkable because it may have occurred without an accompanying eruption. The western flank of Mt. Rainier collapsed and slid into the Puyallup River Valley, where it transformed into a lahar and flowed 60 miles (100 kilometers) downstream. Scientists continue to speculate about the origin of the landslide. The Electron Mudflow reminds us of the possibility that, occasionally, lahars may have non-eruption origins and occur with little warning. This remains one of the greatest threats to surrounding communities and has spurred the development of lahar warning systems to alert nearby communities of the need to evacuate. Mt. Rainier is encircled by 25 named glaciers with a combined surface area of more than 30 square miles, the largest glacial system on a single mountain in the United States outside of Alaska. Mt. Rainier's glaciers are important indicators of climatic change and essential sources of water, supporting six major river systems. The Emmons Glacier has the largest area (4.3 square miles) and the Carbon Glacier has the lowest terminus altitude (3,600 feet) of all glaciers in the contiguous 48 states. A glacier is a mass of ice that is large enough and heavy enough to flow, like a very thick fluid. Glaciers form as snow accumulates high on the mountain, where temperatures are too cold even in the summer for all of the snow to melt before winter sets in again. This is called the accumulation zone, and is typically covered in snow year-round. Over the years, the accumulated snow packs down under its own weight, becoming denser and denser, until it becomes ice. In many places, the slopes of the mountain are steep enough that these massive ice fields begin to flow downhill under the force of gravity at an average of up to 7 inches per day. The glacier is in constant motion as the ice in the accumulation zone flows down to lower altitudes into what is called the ablation zone. The ablation zone is the lower part of the glacier where more snow is lost than accumulates. Glaciers slide across the ground at their base, tearing and grinding rocks out of the mountain as they move, and they twist and deform under their own weight. Avalanches and erosion deposit more rocks on the surface of the glacier, and eventually, the glacier becomes a thick, frozen mixture of ice and rock. As the glacier flows down the mountainside it eventually reaches an elevation where temperatures are warm enough for it to melt. At this point, the glacier becomes a river and a source of drinking water, irrigation, and hydroelectric power for natural and human communities downstream. Meanwhile, snow continues to fall near the top of the mountain, replenishing the glacier. When the glacier melts, all of the rock embedded in it melts out of the ice and into the riverbed. The river gradually tumbles the rock downstream, carrying it toward the ocean. The river is constantly rearranging the rock and changing course around it, always seeking the easiest path through the debris. This is why glacial riverbeds are wide and rocky, with the river itself braided into constantly-changing channels and sub-channels somewhere down the middle. This on-going process of rocks left behind by glaciers accumulating in rivers is known as aggradation and can easily be seen as we drive across the Nisqually River Bridge on our way to Paradise. Glaciers can vary widely in size and shape, but generally display the same framework. The blue outline in the image on the right marks the edges of the Emmons Glacier, located on the eastern slopes of Mt. Rainier and viewed from the Emmons Vista Overlooks at Sunrise. Letters pointed out on the photo mark out different glacier features. A) Crevasses are cracks and breaks in the glacier ice, formed as the ice moves unevenly over the slopes of Mt. Rainier. The circle around "A" shows a magnified view of a small portion of the crevasses on the Emmons Glacier. B) Rock debris covers the lower portion of Emmons Glacier. Much of this rock came from a large rock fall in the 1960s. The rock layer helps insulate the glacier's ice from melting and is believed to have contributed to an advance of the Emmons Glacier for a time after the rockfall. C) Terminus, or end, of the glacier. D) Water from melting glacial ice leaving the terminus of the glacier. The melt water from the Emmons Glacier is the source of the White River. Streams flowing from glaciers are clouded with fine sediment, called glacial flour, created by the glacier grinding its rocky bed. The glacial flour gives the water a milky color. E) Outwash Plain, filled with sediment, rocks, and other debris left behind behind the retreating glacier. Outwash plains are further shaped by the glacial meltwater streams, forming braided river beds through a process called aggradation. F) Terminal Moraine, a large ridge-like formation of rocky debris left behind by the terminus of the glacier as it retreats. Terminal moraines like the one indicated here mark places in the valley that the glacier extended to in the past. G) Glacial ponds can form if glacier ice broken off the main glacier melts and the water is captured behind a moraine. Terminal moraines can also dam the valley, causing melt water to pool. H) Lateral moraines are debris ridges forming along the edges of the glacier instead of at the terminus. The large, steep lateral moraines near the Emmons Glacier indicated here were left behind by much larger, ice age glaciers that pre-dated the Emmons Glacier. Emmons Glacier as viewed from Sunrise. A team of climbers nears the edge of a large crevasse on Mt. Rainier. Types of glaciers. Most of the glaciers on Mt. Rainier are known as valley glaciers. Valley Glaciers: Most of the glaciers on Mt. Rainier are known as valley glaciers. These glaciers are confined to a valley (usually a former stream valley). Three good examples of this type of glacier are the Nisqually, Carbon, and Emmons glaciers. Cirque Glaciers: The smallest glaciers on Mt. Rainier are cirque glaciers. These small glaciers occupy a bowl-shaped basin at the head of a mountain valley. Cirque glaciers are usually the remnants of much larger valley glaciers. Examples of this type of glacier are the South Tahoma and Inter glaciers. Continental Glacier: Another type of glacier, called a continental glacier, is a large ice sheet that covers thousands of square kilometers. Although there are no continental glaciers in the Mt. Rainier area today, 15,000 years ago much of the Puget Sound west of Mt. Rainier was covered with a continental glacier over 3,300 feet (1,000 meters) deep. Scientists and geologists believe that at least one of the current glaciers on Mt. Rainier may have been a tributary of this ice sheet. Nisqually Glacier is the most visited and best surveyed glacier on the mountain. The Inter Glacier is one of 2 cirque glaciers on Mt. Rainier and sits below Camp Schurman on the Emmons route. The Carbon Glacier has the lowest terminus of any glacier in the contiguous United States. The Cowlitz Glacier is the first glacier to be crossed on the classic Disappointment Cleaver route. 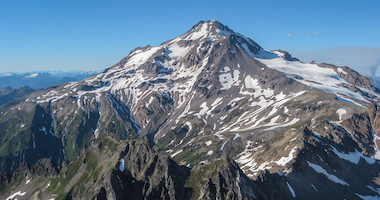 The Ingraham Glacier shares a common terminus with the Cowlitz Glacier, separated by Cathedral Rock. The Summit Crater Glacier is about 200 feet thick and sits atop a maze of snow caverns caused by steam vents. Penitentes are pinnacles of snow that can be several meters tall. They appear on the upper mountain, typically during summer months. At high elevations during the summer the air remains cold and dry but there is an abundance of bright sunlight. The strong sun exposure causes snow crystals to transition directly into water vapor without melting first. This process is called sublimation. As the surface of the snow forms depressions, the curved shape reflects and concentrates the sunlight further, speeding up the process of sublimation and eventually forming a forest of snow spikes. Sun cups are shallow "cup" like hollows in the snow's surface that are also created through exposure to strong sunshine. While sun cups can be created through sublimation, they can also form due to melting. They are typically smaller than penitentes and can occur at lower elevations. A bergschrund is a large, often deep, crevasse that forms at the upper end of a glacier. Sometimes a bergschrund forms between a lower portion of active glacier and an upper portion that has stopped flowing and become stagnant ice or snow. Mt. Rainier also has bergschrunds where the glaciers break off from the summit and, depending on the route and conditions, can be seen up close on our summit climbs. Navigating around a bergschrund high on Mt. Rainier. Seracs are large blocks or columns of glacial ice created when crevasses cross each other. The large pinnacles of ice can collapse unexpectedly, which combined with the broken surface terrain, makes seracs very dangerous for climbers. Seracs can be seen in various locations during your climb, particularly crossing the Ingraham Glacier when climbing the Disappointment Cleaver route. More than 97 percent of Mt. Rainier National Park is legally designated as wilderness, which includes glaciers, forests, meadows, lakes, and other wetlands. In 1964, when Congress approved the Wilderness Act, climate change was not yet recognized as a major threat. Fifty years later, scientists around the world and at Mt. Rainier have identified impacts of climate change on wilderness and ultimately our life on earth. Since 1913, glacial retreat has exposed an area of 14.5 square miles (37.5 square kilometers) of Mt. Rainier National Park lands. Field crews at Mt. Rainier closely study the affect of increasing average temperatures by placing ablation stakes on the lower Nisqually and lower Emmons glaciers. The ablation stakes are installed in the spring using a steam drill that allows crews to drill a hole in the snow and ice, up to 43 feet (13 meters) deep. The stakes are inserted at 6 locations on each glacier from the terminus at 5,300 feet (1,615 meters) up to approximately 11,000 feet (3,352 meters), and serve as a check for melt throughout the season. A quick review of historic data reveals, not surprisingly, that the melt in the first part of the summer of 2015 is greater than early season melt from any previous year dating back to 2003, when monitoring began. For the first time since monitoring began, field crews might have to re-drill ablation stakes in the bare ice of the lower Nisqually because stakes might melt out before the season is over. The Nisqually Glacier has shown significant retreat since its earliest measurements. Damage to the Emergency Operations Center and protective levee at Longmire during the November 2006 Flood. The process of aggradation (the on-going process of rocks left behind by glaciers accumulating in rivers) also seems to be accelerating. One likely reason is that Mt. Rainier's glaciers are melting faster than they are reforming – a symptom of the trend toward warmer temperatures locally over the past century. Glaciers like the Nisqually, which loomed over the Park road less than a hundred years ago, have now melted almost out of sight around a bend in the canyon. As the glaciers melt, they release into the the riverbed the huge volumes of rock and debris formerly locked in the ice and begin to erode into the river. The volume of rock available for the rivers to carry increases and a major flood can cause several decades' worth of normal aggradation to occur overnight. The riverbed where the Tacoma Creek flows under the Nisqually Road rose more than four feet during the November 2006 flood, leaving the bottom of the road bridge just five feet above the river. Glaciers found in Mt. Rainier's wilderness provide storage and the slow release of cool waters during summer. Changes in temperature affect the timing of this release, resulting in warmer summer streams which then affects certain species and organisms that depend on cold headwater streams to survive. Glaciers are receding and this is unambiguous evidence of global warming, and reflects a pattern observed in mountain ranges around the world. Loss of this resource and the late summer water it provides is already affecting lakes, streams, municipalities and hydroelectric projects. Continued loss of glaciers will complicate efforts to protect threatened and endangered species throughout the mountain ecosystems. Since 1913, glacial retreat has exposed an area of 37.5 square kilometers (14.5 square miles) of Mt. Rainier National Park lands. Whatever the cause, the implications are clear: as Mt. Rainier's rivers continue to aggrade, it will become harder and harder to keep them from flooding adjacent roads and facilities. The Park will rely more and more on larger and stronger dikes, levees, engineered log jams, and other flood control structures to separate the rivers from the roads. In the long term, Park managers will have to consider how much effort is warranted to protect vulnerable facilities. Some roads may be closed permanently, or only repaired well enough to be passable until the next flood. Some structures may be relocated to places less prone to flooding, or perhaps removed from the Park entirely. These management questions have become critical at places like the former Sunshine Point Campground, Westside Road, and the Carbon River Road. Planning efforts will carefully consider the likelihood that these places will flood again, maybe in the near future. This may pose significant changes in how we access and develop certain areas of the Park, and may require the repurposing of roads and other facilities into infrastructure more appropriate for the floodplains on which they're built. In the long term, Park managers will have to find ways of living alongside the powerful forces of nature that continue to reshape this landscape. In the course of the National Park's long history since 1899 another significant resource has developed: the cultural heritage of the National Park itself. Today the Park contains four historic districts and more than one hundred historic buildings of national significance, virtually all associated with the first half-century of administration and development of the Park. With its carefully planned roads, campgrounds, and administrative areas, the built environment of Mt. Rainier National Park exhibits perhaps as well as that of any other national park the philosophy of the U.S. National Park Service during its formative years. Sluiskin, a Yakama Indian, served as a guide to Stevens, Van Trump and Coleman on Mt. Rainier, leading to the first recorded summit of the mountain. The Indians of the Pacific Northwest held in awe the snowcapped volcanoes of the Cascade Range. Mt. Rainier, Mt. Adams, Mt. St. Helens, and Mt. Hood, with their looming presence on the horizon, frequent cloud caps, rumbling avalanches, and terrifying eruptions, inspired numerous legends about the spirits that were thought to inhabit them. The Indians' legends told of fiery eruptions in the distant past, of vicious feuds when the mountains hurled rocks at one another, of a great flood when all the lowlands were inundated, killing all creatures except the pure ones which climbed to the mountain tops and ascended ropes of arrows into the sky. In the Indians' view, humans offended the mountain spirits at their peril. The story of Sluiskin, Mt. Rainier's most famous Native American Indian, reveals much about the complexity of the Indian relationship to Mt. Rainier. In 1870, Sluiskin, served as guide to General Hazard Stevens, Philemon Beecher Van Trump and Edmund Coleman who were intent on climbing Mt. Rainier. As the climbing party approached the lower slopes of the mountain, Sluiskin grew more and more despondent. Finally, on the eve of the ascent, he exhorted the white men not to attempt the climb or they would be punished by demons. He told his white companions of the angry spirit that animated "Takhoma" and inhabited a "lake of fire" in the summit crater. He refused to go farther. The white men, undaunted, successfully reached the summit the next day where they took shelter in the warm steam vents that Sluiskin had apparently alluded to, and returned to camp on the day following. Sluiskin, who had given them up for dead, greeted them with cries of "Skookum tillicum! Skookum tumtum!" ("Strong men! Brave hearts!"). Many years later, in 1915, Sluiskin's identity became wreathed in mystery and developed a significance by becoming a symbol for both Indians and whites of the Indian relationship to the mountain. Mt. Rainier National Park, like other national parks, commemorated Indians' past use of the area through Indian place names. White Americans' fondness for Indian names has been described as a form of nationalism, for it celebrated what was distinctively American. Americans were nowhere more enthusiastic about Indian place names than in national parks, with their aim to preserve the American heritage. In Mt. Rainier National Park many glaciers, rivers, parks, and waterfalls took their names from Indian individuals and groups associated with the area, or from the old trading language known as Chinook jargon. The names Nisqually, Cowlitz, Yakama, and Puyallup came from tribes in the region; Sluiskin from the famous guide; Owyhigh from a Yakama chief; Mowich from the Chinook jargon term for deer; Ollala from the term for berries; Mazama from the term for mountain goat. It is very difficult today to separate legends and other facets of the Indians' relationship to Mt. Rainier from the history of the area as a national park. Indian legends about the mountain held strong appeal for whites who sought to preserve and promote the mountain's scenic grandeur. Many white people who themselves felt a kind of reverence for Mt. Rainier worked diligently to preserve Indian legends and place names in order to give Mt. Rainier National Park a local accent. Folklore about Indians and Mt. Rainier was not the only way in which the Park celebrated the past through Indians. In 1925, Yakama Indians agreed to perform for tourists at Paradise Park, on the south flank of Mt. Rainier. They held daily drum dances, rode horses, and demonstrated their spear fishing. Their leader was none other than Chief Sluiskin. At the same time that these Indians were performing some of their people's traditional uses of the Park for the amusement of hotel guests at Paradise, other Indians were continuing to visit Mt. Rainier to gather huckleberries which they dried for food. A historic photo of Indian Henry's Hunting Ground. Next to their feeling of awe about the mountain, Indians were most often remembered for the seasonal use they made of the area for hunting and gathering. Early settlers of Washington Territory told a story about Henry, a Yakama Indian and son of a chief. He was banished from his tribe for killing a medicine man, and forced to flee to the west side of the Cascades. Each spring, the story went, Henry vanished into the mountains. He was nearly given up for dead, only to reappear in the fall, grinning to himself, with his wives looking plump and content and his ponies laden with venison and dried berries. Asked by whites to reveal where his hunting ground was, Henry always shook his head, and the reputation of his secret hunting ground grew each year. Finally, a man succeeded in trailing the old Indian to his summer camp on the southwest side of Mt. Rainier, a place that became known as Indian Henry's Hunting Ground. Within a few years a permanent trail was built to this flower-strewn meadow and it became one of the popular backcountry destinations in the Park. That Henry was a real person, whose Indian name was So-to-lick, mattered less than the fact that his story captured the imagination of so many local residents. The story was another example of how Indian use of Mt. Rainier became intertwined with local mythology about the mountain. The relationship of Indians to Mt. Rainier is a complex one. Inasmuch as the national park is a celebration of the American heritage, it has made Indians like Sluiskin and Henry into symbols. Although Indian use of the area predated the establishment of the Park, the Park reshaped the Indians' relationship to Mt. Rainier by profoundly influencing the way the Indian past was reconstructed. Indian legends concerning Mt. Rainier and anecdotes concerning Indian use of the area were distorted at the same time that they were amplified by the existence of the Park. Furthermore, Indian use of the Park was altered at the same time that past Indian use of the area was romanticized. Indian use of the area continued for several years after it became a national park, but hunting and gathering clashed with local citizens' views about how the Park should be used which ultimately clashed with the implementation of federal land management responsibilities. Indian Henry's Hunting Ground has become one of the most popular hiking destinations in Mt. Rainier National Park. National park managers have long understood that land uses outside parks, indeed long distances from parks, can produce environmental changes inside park boundaries. Major land uses such as logging, the construction of the transcontinental railroads, and urbanization have shaped the political environment of Washington state and, therefore, have had a ripple effect on the cultural landscape of the Park and how it was administered. The timber industry became the leading sector in the regional economy as early as the 1850's and remained so well into the twentieth century. Transcontinental railroads exerted enormous influence on the area's development in the 1880's and beyond, and created the necessary conditions for the rise of Seattle and Tacoma in the last twenty years of the nineteenth century. These growing cities played a significant role in reshaping people's attitudes about the wilderness and the way they used it. The legislation which established the park was in some ways precedent-setting. Mt. Rainier was the first national park to be created from lands that were already set aside as forest reserves, forming a precedent for numerous national parks established in the twentieth century. Early visitors to western Washington found that its wet climate had produced a lush growth of Douglas fir, hemlock, spruce, and cedar, from the slopes of the Cascades to the very edge of Puget Sound. Early lumbermen recognized the region's economic potential as soon as the California gold rush created a market for lumber on the west coast. The first major change in Washington's timber industry occurred with the completion of the transcontinental Northern Pacific Railroad in 1883. The railroad stimulated settlement, created local markets for lumber, and linked the Pacific Northwest to markets back east. Efficiency was also the watchword of the new conservation movement. Led by Gifford Pinchot, forestry "professionals" sought to manage forests as though they were crops, harvesting trees when they were "ripe," protecting stands against fire and disease, guarding against deforestation and soil erosion. Government forestry initially focused on research and conceived of its role as an advisory one; after the turn of the century, however, the Forestry Bureau (later the U.S. Forest Service) began to concern itself primarily with the management of forest reserves (national forests). In Washington, as elsewhere in the West, leaders in the timber industry generally supported conservation as part of their drive to resolve problems of over competition and supply. The groundswell of suspicion by westerners toward federal control of resources reached a peak during the administration of President Theodore Roosevelt, in the first decade after Mt. Rainier National Park was established. All of the land included in the Park today was previously set aside as forest reserve or national forest land. The Pacific Forest Reserve, proclaimed on February 20, 1893, formed roughly a square thirty-five miles on a side, with the summit of Mt. Rainier on its western edge. A subsequent presidential proclamation on February 22, 1897 changed the name of the reserve to the Mt. Rainier Forest Reserve and greatly enlarged its boundaries to the west and south. By the time Mt. Rainier National Park was established in 1899, the timber industry was already shaping western Washington's cultural landscape in ways that reached far beyond the extent of actual logging operations. Forest lands throughout the Cascade Mountains were being surveyed, purchased, taxed, protected from fire, and placed in reserves for future logging operations and for watershed protection. These myriad forest activities created a political and economic climate which continued to affect land use around and even inside the Park after it was established. Railroads shaped the cultural setting of Mt. Rainier in a very different way than the timber industry. Their primary significance was in binding the Pacific Northwest more closely to the national economy. They not only brought a flood of new settlers to Washington and carried Washington's products to eastern markets, but their advent encouraged an influx of investment capital into the Pacific Northwest as well. They even had the ability, through their popular advertising posters and brochures, to mold public attitudes toward the national parks. Finally, branch lines affected land use and settlement patterns in the vicinity of Mt. Rainier. Both the Northern Pacific and the Milwaukee Road took an interest in developing branch lines to tap the timber and mineral resources in the upper Nisqually and Cowlitz valleys. In 1902, the so-called Tacoma and Eastern reached the new town of Eatonville, and two years later reached as far as Ashford, seven miles from the new National Park boundary. These railroads were built primarily to exploit the timber and coal resources in the Cascade foothills rather than to profit from passenger traffic to Mt. Rainier. However, the railroads were always looking for additional sources of income for their lines and they were certainly not blind to the possibility of developing a lucrative tourist business. More importantly, however, the relationship between the railroads and this National Park was tempered by the proximity of Seattle and Tacoma. These two cities would prove to be the real driving forces of Mt. Rainier National Park's development, providing local initiative for road and hotel construction and a concentrated population of park users with an effective political voice. The growth of a major metropolitan area on Puget Sound became the most important feature of Mt. Rainier National Park's cultural setting. The cities of Seattle and Tacoma provided much of the stimulus for the establishment of Mt. Rainier National Park and much of the capital for its development. The cities' chambers of commerce boosted the National Park and involved themselves deeply in its administration, both through the state's senators and congressmen and through their self-appointed Rainier National Park Advisory Board. Residents of Seattle and Tacoma accounted for a large proportion of the Park's visitors, many of whom found a voice for influencing park administration through outing clubs like The Mountaineers. The proximity of Mt. Rainier National Park to the two cities made the park increasingly oriented to weekend and day use by automobilists. Arguably, the relationship of this park to its nearest cities was more pronounced than that of any other national park in the United States. Even before the establishment of the Park, citizens of Seattle and Tacoma laid claim to the mountain as a symbol of the good life in the Pacific Northwest. Even before the establishment of Mt. Rainier National Park, citizens of Seattle and Tacoma laid claim to the mountain as a symbol of the good life in the Pacific Northwest. The beauty of Puget Sound's forests, lakes, tidewater, and mountains was a source of civic pride, and the image of Mt. Rainier looming on the horizon beyond Seattle's Lake Washington or Tacoma's Commencement Bay was the most commonly used symbol of that pride. While the 1890's and 1900's marked the heyday of Seattle's identification with Mt. Rainier, Tacomans had been trying to lay claim to the mountain's symbolism for much longer. Indeed, their city took the name Tacoma from the Indian word for "snow peak," which it was said the Indians applied specifically to Mt. Rainier, and much of the boosters' efforts to identify their city with Mt. Rainier focused on getting the name of the mountain officially changed to Mt. Tacoma. The effort dated from as early as 1873, though it reached fever pitch on three subsequent occasions: in 1890 and 1917, when it was twice brought before the United States Geographic Board, and in 1925, when it briefly claimed the attention of Congress. The desire of Tacomans to capitalize on this name association was, of course, the real basis for the feud over the mountain's name, even though the debate focused mainly on the authenticity of the Indian name "Tacoma" and the allegedly unpatriotic and prosaic flavor of the official name "Rainier." The residents of Seattle and Tacoma came to view a trip to the mountain as a favorite destination for country outings, and a climb to its summit as the supreme physical challenge in the region. As late as the 1880's, a trip to the mountain was still almost an expeditionary event, but in the last decade of the nineteenth century it evolved fairly rapidly into a more commonplace activity. This was due to the fact that by the early twentieth century, the new National Park was already experiencing the kind of visitor use pattern that would become more and more pronounced as time went on: the weekend day-trippers had arrived. Longmire Springs Hotel. The earliest tourist accommodations predated the national park. Closely akin to the mountain climbing expeditions in this era were the horseback riding, fishing, and camping parties who visited Mt. Rainier. As early as the 1880's, the Northern Pacific Railroad found that sufficient demand existed to run excursion cars from Tacoma to Wilkeson, where tourists hired horses and guides for trips into the Carbon River high country. Yelm mountain guide and pioneer James Longmire, seeing the future in tourism, found an attractive site by a mineral springs on which to develop his own hotel and spa. In 1884, with the help of some Indians, Longmire cleared a wagon road from Succotash Valley (Ashford) thirteen miles to the springs (Longmire), where he built a rough cabin. By 1889, the Longmire family had two bathhouses and some guest cabins completed and were advertising their health spa in the Tacoma newspapers, and by next season they were operating a rustic two-story hotel. The idea that Mt. Rainier's scenic grandeur was a commodity which could be packaged and sold came to be shared by many people in Tacoma and Seattle in the course of the next century. It would form an important part of the National Park's cultural setting. After passing the Mt. Rainier Park Act, Congress showed little enthusiasm for appropriating funds with which to administer the new national park. Not until 1903 was the park placed under the nominal supervision of Mt. Rainier Forest Reserve Supervisor Grenville F. Allen, and not until 1910 did the park have its own superintendent. Yet in spite of these limitations, park officials established the rudiments of administration during the first decade and a half of the park's existence. They built up a ranger force, cleared trails, constructed administrative buildings, and strung telephone lines. With the help of the state legislature and Congress, they resolved all doubts about their authority to enforce regulations within the jurisdiction of the park. They helped coordinate the efforts of the General Land Office, the Geological Survey, and the Forest Service on a variety of land issues. These included the disposition of the Northern Pacific's land grant inside the park, the marking of boundaries, the completion of Mt. Rainier's first topographical survey, and the maintenance of the park access road where it crossed a three-mile strip of national forest land. "There are plenty of higher mountains, but it is the decided isolation—the absolute standing alone in full majesty of its own mightiness—that forms the attraction of Rainier." Mountaineering has played a significant role in the shaping of the cultural landscapes of Mt. Rainier National Park. Early climbing expeditions fostered local interest in the mountain and even contributed to the national park movement on a larger scale. Seattle and Tacoma newspapers followed climbers' exploits with avid interest and the return of a mountain climbing party was cause for much excitement. Many of the pioneer climbers subsequently played important roles in the campaign to establish the Park beginning in the 1890s by publicizing their climbs through writings, lectures, and lantern slide presentations. In 1905, the Sierra Club (based in San Francisco) and the Mazamas (based in Portland) organized large expeditions to Mt. Rainier. At that time these were the only two well-organized mountain clubs in the western United States. Seattle and Tacoma mountain enthusiasts made several attempts to form their own mountain club, and finally succeeded with the founding of The Mountaineers Club in 1906 which was actually an offspring of the Washington Alpine Club originally formed in 1891. The formation and affiliation of these clubs contributed to the building interest in Mt. Rainier National Park through a shared purpose: to promote outdoor recreation and nature preservation. Each year around ten thousand climbers attempt to summit Mt. Rainier. Mt. Rainier is the gateway into the world of mountaineering and has served as the training grounds for generations of mountaineers that have gone on to successful climbing careers in some of the most challenging mountainous regions around the world. It's sheer size, terrain and unpredictable weather give climbers the experience akin to many of the world's highest ranges, and it is where Jim Whittaker and the first U.S. team to summit Mt. Everest in May 1963 came to train. Mt. Rainier's sheer size, terrain and unpredictable weather give climbers the experience akin to many of the world's highest ranges. It is where Jim Whittaker and the first U.S. team to summit Mt. Everest in May 1963 came to train. An RMI guide on Mt. Rainier during the eruption of Mt. St Helens. May 1792 – British Captain George Vancouver was the first to see the "round snowy mountain" during an exploratory visit to Puget Sound. Vancouver named the peak for Rear Admiral Peter Rainier of the British Royal Navy. July 1857 – A climbing party led by Army Lt. August Valentine Kautz makes it above 13,000 feet, but turns back because of snow blindness and exhaustion. Aug. 17, 1870 – First documented summit climb by Hazard Stevens and Philemon B. Van Trump who were led by Native American guide Sluiskin (to current day Sluiskin Falls), and reached the summit via the Gibraltar Rock route. Oct. 1870 – Second successful ascent by Samuel F. Emmons and A.D. Wilson. 1885 – Warner Forbes, Richard Wells, and George James of Snohomish reached the summit via the Winthrop Glacier after abandoning the North Wall. 1888 – Naturalist John Muir visits Mt. 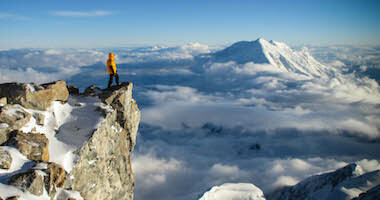 Rainier and climbs to the summit with Maj. Edward S. Ingraham via the Gibraltar route. Aug. 10, 1890 – Fay Fuller, a teacher from Yelm, is the first woman to reach the summit. Age 20 and single, her climb alone with four men scandalized Tacoma society. 1891 – A hound belonging to Dr. Warren Riley, and accompanied by P.B. Van Trump and Alfred Drewry becomes not only the first canine to climb the mountain, but to do so via a new route, the Tahoma Glacier. July 27, 1897 – Professor Edgar McClure carries a barometer to the summit in an effort to measure the mountain's height, then dies in a fall on his way down (McClure Rock) – the first recorded climbing fatality. March 2, 1899 – President William McKinley signs a bill authorizing the creation of Mt. Rainier National Park, making the nation's fifth national park. 1915 – The 93-mile Wonderland Trail is completed. 1916 – The National Park Service is created and the Rainier National Park Company (RNPCo) is granted a 20 year "preferential concession" lease. A stone shelter is built at Camp Muir for use by climbers. July 1929 – Six climbers slide into a crevasse. Guide Forrest Greathouse and one client, Edwin Witzel, die. The notch through which their bodies are transported is named "Cadaver Gap." 1937 – A part of the Gibraltar Rock route, the most popular route to the top, collapses. 1942 – World War II begins. Paradise and the upper slopes of Mt. 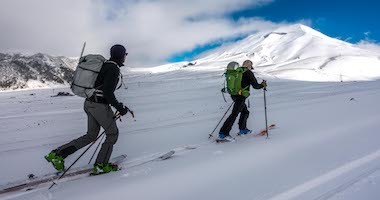 Rainier are used by military ski troopers for winter training, using methods developed by the Finnish army and developing new tactics and equipment. Dec. 10, 1946 – A Marine Corps C-46 transport plane crashes into Mt. Rainier, killing thirty-two. 1961 – Camp Schurman Cabin is completed at Steamboat Prow at 9,702-foot elevation. It is intended as an inclement weather shelter for those climbing via the Emmons Glacier route. 1965 – Winter climbs of Mt. Rainier are authorized. Four are attempted, only one successful. 1969 – Rainier Mountaineering, Inc. (RMI) is formed when Lou Whittaker partners with Jerry Lynch to establish a guide service dedicated to teaching as well as leading climbers – an approach that far exceeded the standard guiding model of the day in which clients followed guides, but rarely participated as a valued member of a team. RMI ushered in a new era of mountain guiding. June 1972 – Joe Horiskey leads the first RMI Expedition Seminar to the summit via the Kautz route and camped on the summit. 1975 – Peter Whittaker, Lou Whittaker's son, started guiding on Mt. Rainier. Since then, Peter has become a major partner in RMI, taking over the leadership of RMI in the late 1990s. June 21, 1981 – An RMI climbing party of 5 guides and 20 clients en route to the summit are struck by an ice avalanche, killing 11 climbers. Aug. 1992 – Jack Borgenicht becomes the oldest man to summit the mountain, celebrating his 81st birthday at the crater rim. The record held until 2004 when William Painter, also 81, reached the summit. Painter climbed again in 2005 at age 82, and in 2007 at age 84. July 1997 – RMI Guide Alex Van Steen leads an Expedition Seminar on the first ascent of the Fickle Finger of Success, the western of three gullies on the Success Headwall. Currently, though others have climbed more routes, Van Steen has legally guided a greater number of routes or route variations to the summit of Rainier than any other guide in history – 15. September 17, 2008 – After a flurry of speed activity on Mt. Rainier in 2008, Willie Benegas set the record and completed a speed ascent of Mt. Rainier making the car-to-car trip in 4 hours 40 minutes and 59 seconds. June 2010 – In his 25th year of guiding, RMI Guide Brent Okita reaches his 400th summit of Mt. Rainier and his 19th summit of Denali. July 24, 2012 – Katie Bono completed a speed ascent of Mt. Rainier ascending from the Paradise Parking Lot to the summit of Mt. Rainier and returning to Paradise in 4 hours and 58 minutes. Her ascent is believed to be the fastest by a female climber. Camp Muir, originally know as Cloud Camp, is located on a narrow east-west ridge at 10,080 feet on the Gibraltar route (and today the popular Disappointment Cleaver route) and was long believed to be the most direct route to the summit. It was the route that John Muir, founder of the Sierra Club, followed in his 1888 climb to the summit with Seattle mountaineer Edward S. Ingraham. The site is bound on the north and south sides by the Cowlitz Glacier and the Muir Snowfield respectively. As mountaineering on Mt. Rainier grew in popularity, a climbing fatality in 1897 prompted calls for the construction of a high-elevation shelter for climbing parties. A decade later the U.S. Army Corps of Engineers recommended the construction of a shelter at Camp Muir that was approved in 1911 and funded through private donations, but did not see completion until after John Muir's death in 1914. The shelter was constructed in 1916 at a cost of $573.00. Soon after, more structures were built to accommodate the increased amount of climbers as a result of the dramatic growth in the popularity of climbing. Today, Camp Muir is designated as a National Historic Landmark and is predominantly used by the public (overnight and day visitors), NPS staff, and guide services as a base camp for summit climbs. There are four primary structures at Camp Muir that are currently in use today. Descriptions of their history and use are below. John Muir originally recommended the Camp Muir site because of the pumice deposits found there. He believed that they indicated the site was sheltered from the high winds that attacked the mountain's higher elevations. This was later found to be in error as evidenced by the instability and deterioration of the site cause by the high winds that batter the ridge. The historic Guide Shelter, originally known as the Climber's Shelter, was designed by Seattle Architect, Carl F. Gould (a member of The Mountaineers). The structure blended in naturally, almost to the point of being camouflaged with the surrounding ridge since it was made up of stone found on the ridge. Currently, the exterior rock walls are mortared, but historical photographs indicate that the walls originally were dry-stacked. The one-room interior contains sleeping quarters and a small kitchen. The shelter was repaired in 1966 as a result of structural deterioration, then in 1969 it was converted for use as a kitchen and quarters for guide service staff. Despite a relatively unsophisticated building effort, the Guide Shelter has stood for more than eighty years in a severe environment relatively intact. This structure is currently used by NPS climbing rangers. Public Climber's Shelter at Camp Muir. In 1921, the National Park Service built a second, larger structure at Camp Muir that became the Public Climber's shelter and was designed by Superintendent Peters and also blended in with the surrounding environment. It was about twice the size of the first structure, and was similarly a stone masonry one-room structure that now contains wood bunk platforms providing space for overnight campers. At the time of construction, the original building was dedicated for mountaineering guides while this one served the public. It was remodeled in 1968 to accommodate increased climber use of the facilities and received a dedication plaque to John Muir fixed to the structure. This is the smallest of the historic structures at Camp Muir and is perched on the north edge of the Muir saddle above the Cowlitz Glacier. It was constructed by the Civilian Conservation Corps (CCC) between 1935 and 1936, and originally intended to function as a men's comfort station with pit toilets until new toilets were added to the site in 1973. It was then converted to storage space. This A-frame shelter sits higher on the ridge than the other structures and was originally constructed for NPS mountaineering rangers. The design of this small shelter was intended to handle unrelenting snow loads, high winds, and many seasons of use. Today, this structure is currently used by RMI guide staff while the NPS climbing rangers now use the original Guide Shelter. Although not considered a historic structure, the Gombu shelter has stood on the ridge since 1970 and was originally constructed by RMI as a shelter for climbing teams. The massive walls in the Guide Shelter structure are over four feet thick in some locations around the base, and taper to nearly two feet thick at the top. Aerial view of Camp Muir. The Muir Snowfield extends down to the left (south) towards Paradise and the Cowlitz Glacier sits on the right (north) side of the ridge. The Army Corps of Engineers, under the direction of Ricksecker, surveyed the Nisqually Road, superposing proposed routes onto photographs. Only one road went all the way to the new National Park. The so-called Mountain Road was built by James Longmire and a crew of Indian laborers in 1893, and went from Kernahan's Ranch (Ashford) to Longmire Springs. At first, use of the road was restricted to wagons whose axles could clear the dozens of stumps that still needed to be rooted out from between the parallel wheel ruts, but by 1896 the road was open to stages. Beginning in that year, the Tacoma Carriage and Baggage Transfer Company took tourists to Mt. Rainier via an overnight stop in Eatonville. During the first four to five years after the Park's creation, upwards of 500 people visited the mountain each summer season following the completion of the Tacoma and Eastern Railroad to Ashford, and the simultaneous inauguration of a connecting stage service over the remaining thirteen miles to Longmire Springs. While some visitors were content to remain at the Longmire Springs resort and enjoy the mineral baths and the view of Mt. Rainier from there, most wanted to get a closer view of the glaciers and experience the mountain's famous alpine meadows. The Nisqually River Valley route was chosen as the ideal route to construct the road because it was the most popular among tourists due to the fact that a road and trail already existed to Longmire Springs and Paradise Park, and it was the approach most often used by climbers. Early roads were constructed by hard labor, using picks, shovels and blasting powder to carve the rugged terrain. The people of Washington state generally agreed that the first need of Mt. Rainier National Park was to get an adequate road built, presumably to Paradise Park. In August 1900, Washington's Representative Francis W. Cushman requested the U.S. Geological Survey to make a preliminary survey and cost estimate. The USGS report suggested that a road from the southwest corner of the Park to Paradise Park could be built for $90,000. In January 1901, Cushman forwarded this report to the Secretary of the Interior with the suggestion that the department request an appropriation in the next sundry civil appropriation bill. This was the first appropriation made for Mt. Rainier National Park and the road to Paradise would be the only one undertaken by the War Department. The War Department's legacy was enhanced by the dedicated service of Eugene Ricksecker, the assistant engineer who designed and supervised construction of the road and maintained a lively interest in all phases of the Park's development until his death in 1911. In the spring of 1903, Ricksecker settled on the Nisqually River Valley as the best alternative because it was the most popular among tourists owing to the fact that a road and trail already existed to Longmire Springs and Paradise Park, and it was the approach used most often by climbers since it led to the easiest route of ascent of the mountain's summit. Ricksecker emphasized that the road would be designed "solely as a pleasure road." A pleasure road was a rare specimen of engineering in that era, made all the more unusual by the mountain topography. The road would not only give access to the highcountry, but would harmonize with the landscape and itself give pleasure to the traveler. What stamped this as a scenic road above all was the gentle gradient, which added considerably to the road's length. It was constructed with about a 4% gradient as this was determined to be the steepest up which horse teams can trot and because grades steeper than 5% cannot be ascended with reasonable effort by cyclists. In 1908, the road was opened to the Nisqually Glacier – the first road in the U.S. to reach a glacier. The road to Paradise became one of the earliest scenic mountain roads in the national park system. Concessionaire busses at the Paradise Inn, late 1920s. Today, increasing auto traffic is pressuring a return to shuttle services. In 1907, the road was completed from the Nisqually Entrance to Longmire Springs, and for the first time ever automobiles were admitted into the Park. In 1908, the road was opened to Nisqually Glacier—the first road in the United States, it was said, to reach a glacier. In 1909, it was completed to within a few miles of Paradise Park, and in 1910 the last difficult stretch above Narada Falls was constructed. In 1910, nearly twice as many people came to Mt. Rainier by car as by train and stage. Automobilists held the advantage over train passengers in numbers even as the outbreak of war in Europe brought a huge increase of out-of-state tourists to Mt. Rainier in 1915. A car reached Paradise Park under its own power in 1912, but the road was so narrow above Narada Falls that it was not opened to cars generally until 1915. Ricksecker spent nearly seven years supervising the construction of this impressive road—one of the earliest scenic mountain roads in the national park system. "Sustainability does not require a loss in the quality of life, but does require a change in mind-set, a change in values toward less consumptive lifestyles. These changes must embrace global interdependence, environmental stewardship, social responsibility, and economic viability." Responding to climate change is the greatest challenge facing the National Park Service today. Our national parks contain the most treasured landscapes and important historical sites in this country. National parks have always helped us better understand the workings of our planet, the lessons of history, and our relationship to the world around us. Even under the threat of climate change, these natural and cultural resources can teach us how our planet is changing and show us a way to continue to preserve them for future generations. 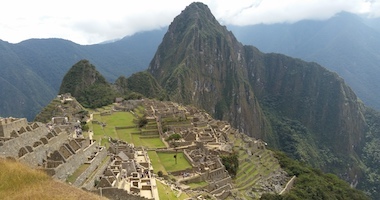 As evidence of human contribution toward climate change increases, Mt. Rainier National Park is making a serious commitment toward reducing greenhouse gas emissions and promoting sustainable practices that help preserve the earth's natural resources so they are passed on to future generations in a healthy and abundant manner. While climate change is a global problem, every individual has a role to play in finding a solution, from reducing your carbon footprint at home to contributing to citizen science efforts. We all share the responsibilities of caring for our environment and conserving natural resources. As visitors and climbers to the Park, there are several ways we can contribute to sustainable practices before, during and after your visit to Mt. Rainier National Park. All RMI guides practice and teach Leave No Trace principles which will be reviewed at your Orientation. Leave No Trace was developed to teach people of all ages how to enjoy the outdoors responsibly and ethically to help ensure long-term health of our natural world and public lands. We encourage you to embrace the Leave No Trace principles and act as an example for other visitors to the Park. In preparation for your climb, please consider some of the following tips to help make your visit to Mt. Rainier National Park a green one! It can be harder to be green when you're traveling. But with a little advance planning there are several simple steps you can take to shrink your carbon footprint on the road as well as at home. Before you leave home, turn down your heating/cooling, lower the temperature setting on your water heater, turn lights off or put them on a timer, and use motion sensors on porch lights. Drive your most efficient vehicle for the number of people in your group and equipment for your trip. Install solar panels on your camper or RV so you don't have to use a generator as often. Take with you and use your refillable travel mugs and water bottles instead of paying for containers that will be discarded. Choose materials responsibly - Recycled paper, plastics and aluminum use 55-95% less energy than products made from scratch. Recycle! Most parks, including Mt. Rainier National Park, have recycling bins available to the public and accept most recyclable items. Recycling aluminum cans is especially efficient. If you do drive into the Park, do not idle your vehicle. Letting a car idle for just 20 seconds burns more gasoline than turning it off and on again. By turning off the motor you will save gas, reduce noise, reduce wear and tear on your vehicle, and keep the air cleaner. Give your feedback to the Park; your input is valuable. Throughout the National Park Service they are taking many steps to mitigate our greenhouse gas emissions. However, we are open to new and inventive ideas and different approaches. Leave a comment form at the visitor center or send an email. Practice these steps at home, whether you are packing for a trip to national park or just going to the grocery store. Staff at Mt. Rainier National Park are also involved in implementing sustainable practices. The program encompasses energy efficiency, green purchasing, recycling, and environmental design. Mt. Rainier National Park's involvement in the Climate Friendly Parks program has helped reduce greenhouse gas emissions from Park operations by approximately 30% from 2006 to 2014! Conducting environmental analysis on construction and design projects. The Park is engaged in a wide variety of planning and construction projects that have the potential to impact Park resources including air, water, plants, wildlife, historic structures, etc. The Park conducts environmental analysis and resource professionals and other staff engage in collaborative planning to identify the best possible alternatives, with the least possible impacts. Use of a hybrid solar energy system in the White River area. The solar system replaced a generator-only system and produces 85% of the electricity required for the area, reducing the generator-supplied energy to 15%! The benefits of the system are reduced fuel consumption, reduced emissions, reduced noise levels and lower operating costs. Focusing on using new "green" products as they are developed. One of the Park generators and all of the diesel vehicles now run on special emissions-reducing fuel made with soybean-based, low-sulfur fuel. Additionally, in the Park fleet we have hybrid vehicles, which combine a traditional internal combustion engine with an electric motor in order to reduce gas consumption. As an Energy Star Partner Organization, the Park is committed to lowering energy consumption by purchasing Energy Star rated devices including refrigerators, furnaces, and computers. We use energy efficient lighting, including compact fluorescent light bulbs. Reduction of consumption of resources by reusing and recycling products. In addition to the usual items- aluminum, plastic, glass, and paper- the Park recycles scrap metal, used oil, batteries, and a number of other items. They purchase recycled products including plastic bags, picnic tables, lumber, pre- and post-consumer recycled paper, and automobile parts. In addition to recycling, Park concessions collect food waste for compost (36.7 tons collected in 2012) and donate used cooking oil to be converted into biodiesel.